MDF (medium density fiberboard) is used for many building projects, especially those with routed details like dollhouse kits and miniature display bases. It is easy to work material which takes detailing well. Unfortunately, it swells with moisture or water and swells noticeably with the application of acrylic (water based) paints, especially thinner formulations used to paint detailed miniatures, creating a fuzzy surface which is very difficult to correct. To prevent frustration when finishing displays or items built from MDF you should seal the edges and the wood surfaces before applying acrylic (water based) paint coatings. If your MDF project will be anywhere near high humidity or water, it should be primed and sealed on all edges to make sure it does not swell or distort, as even a small amount of water seeping under an MDF unit can cause sections to swell noticeably if they have not been sealed. The edges of MDF boards absorb paint heavily. Make sure to seal these, especially if they have routed details. You can use an acrylic paint sealer or drywall sealer, or you can use glue or oil based primers which will help prevent the edges from swelling. Use whichever primer will dry fastest in your particular humidity. The trick is to keep moisture to a minimum. Sealing MDF with PVA Glue: To seal the edges (or flat surfaces) you can spread or spray a layer of thin PVA (white or carpenter's) glue over the edge with a glue spreader, or a pump spray bottle or air brush, making sure the glue layer is as even as possible, with no build up at the edges. The sealed MDF edge can be sanded when dry, but you should not completely sand through the glue coating. Sealing MDF Edges With Oil Based Filling Primers: Oil based filling primers are another alternative for priming MDF edges can also be used on the edges, then sanded down when thoroughly dry. Seal MDF with Drywall Compound and Primer: Another method of filling the edges involves rubbing a thin coating of drywall compound into the edges, wiping the drywall compound off as evenly as possible, then sanding it when dry, before applying a primer. Seal the MDF with PVA Glue: You can seal MDF surfaces with thin layers of PVA (white or carpenter's) glue. Most PVA-based carpentry glues require dilution with water to get a thin sealing layer on your MDF (which can cause the MDF to swell). Thin, acid neutral PVA glues designed for paper and bookbinding work well if applied with a roller, spreader or spray bottle designed to work with thinner glues. Some brands of PVA as a primer may continue to be slightly 'rubbery' under paint coatings and will not withstand wear as well as paint applied over solvent based primers. 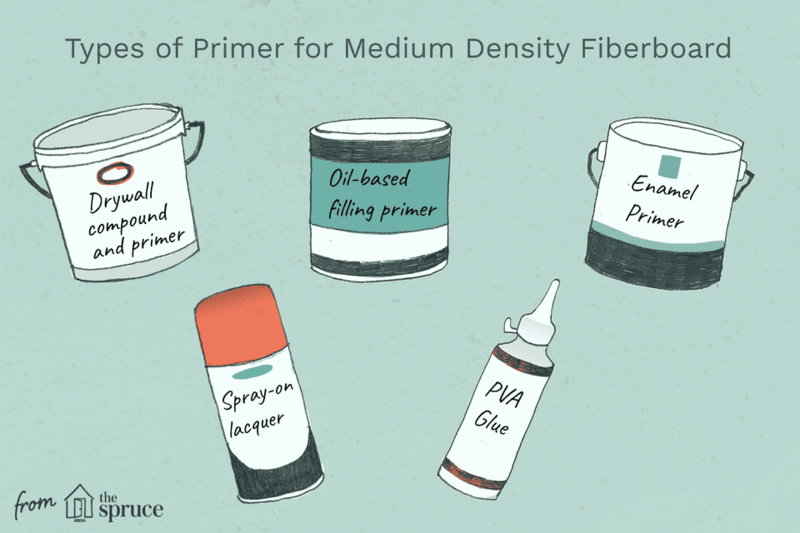 Using a Paint Primer For MDF: Primers used for MDF should be solvent rather than water-based. (lacquer or enamel, rather than acrylic). Stain covering primers (Zisser makes one in a spray can) have a heavier body and can be used for the edges as well as flat and detailed surfaces. For miniatures/ dollhouses or projects with fine cut details (1/4 scale siding etc. ), these heavy-bodied primers may be too thick and may soften detail. Using a Spray-on Lacquer: Clear or colored spray lacquer can be used as a primer over MDF with good results. Use one designed for exterior finishes. Some lacquers create very smooth coatings which inexpensive craft paints will not adhere well to. If you use these liquid acrylics for painting your miniature projects, test them over the lacquer to make sure they adhere well before you use them to topcoat the lacquer primer. Take care to follow instructions when working with lacquer primers. Avoid all heat sources and work in a well-ventilated area. Using an Enamel Primer: Enamel primers work well for sealing MDF surfaces provided you apply thin coats and do not build up layers which will run or drip as the enamel dries. Choose a color of primer which will work well under your eventual topcoat, and keep the primer layer as thin as possible. Avoid using thick 'one coat' enamel sprays as they may cause you to lose crisp detail lines. Before using MDF, check to see whether you might be better to use Baltic Birch plywood instead.